Disney World may be the “Happiest place on earth”, but my happy place is Puerto Peñasco, Mexico. The reasons for a Rocky Point vacation are many. It’s the closest drive for an ocean beach destination, it’s a good value for food, drink, housing, and interesting things to do. I like to be the first one to leave foot prints on Mirador Beach in the morning. I am usually rewarded with a brilliant sunrise of orange, purple, red, pink, and blue colors that blend the sea and sky. After I have had my coffee, (no herbal tea please) breakfast, and a calm sea, I am good to go fly fishing. The fly fishing keeps me coming back, but friends and family enjoy the beach, quad riding, sunset cruises, shopping, golfing, diving, horseback riding…this is a happy place! Anticipation – something to look forward to is one mood-improver. I usually have a fishing trip or two on my calendar. The prep for the trip always gives me something to look forward to, and a sense of accomplishment. I am usually planning the trip with other fly fishers, which results in spontaneous group happiness. We are like an excited group of cub scouts planning their first camp out. I started fishing when I was 6 years old, I am in my 60’s and I am still finding better ways to fish, new fish to fish for, new ways to enjoy the fishing experience. Even when the fishing is slow it can be enjoyable. The first day of our fishing trip Grant Baugh and I hiked into the First Estuary. We were expecting to catch a few fish, but we got skunked. The second day we launched the pontoon boats at Sandy Beach and fished the new jetty. It was winter, the slowest time of year for a good fish bite, we were not expecting spectacular fishing. I managed to catch a Pompano, two Trigger, and three Grouper. Grant tangled with the best fighting fish he has ever hooked in the Sea of Cortez. The battle was intense, the fish was taking line, and suddenly it was all over, before Grant could identify the fish. Grant was left wondering if it was an equipment failure or if he had played it wrong. He still had a smile on his face when we stopped for lunch at Wrecked at the Reef. We sat on the patio outside enjoying the sunshine, the view of the sea, and tasty shrimp baskets. Setting seaside in the warm winter sun is a happy way for old guys to spend the afternoon. It is almost Spring Break, the water is starting to warm up, and a trip to Rocky Point most likely will improve your happiness. You won’t need a degree in Fly Fishing, but bringing the right gear will help get you into some fish. I would suggest a 6 to 8 weight fly rod with a 200-400 grain sinking line. A pontoon boat rated for saltwater will extend your productive time on the water. Don’t forget your PDF, sun block, and assorted colors of #4 Clouser Minnows. 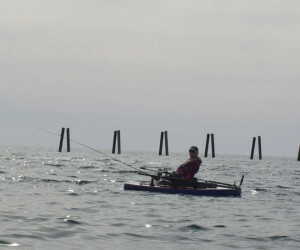 I hope this short story has inspired you to come to Puerto Peñasco with your fly fishing gear and a desire to hook a few fish, I would like to see you on the water soon. Vince Deadmond The Fly Fishing Hardware Guy can be reached at Best Hardware 237 N Apache Trail apache Junction, AZ vince@ajbest.com and at (480) 982 7461.